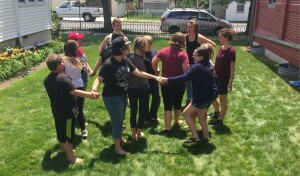 In many ways, it’s the middle schoolers who get lost in the shuffle, especially when it comes to religious activities. After all, the younger children have things like vacation Bible school and regular Sunday School tailored for their needs, and the high-school kids seem to have built up a strong bond among themselves by the time they reach that age. Sensing that the middle schoolers in her community of Summit Hill, PA, needed something that would both entertain and educate them, the Rev. Kari Olson decided to organize a weeklong summer day camp centered around art and theater. 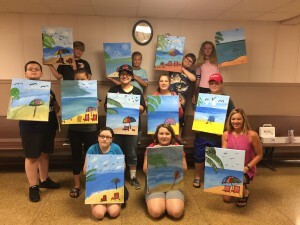 Located at Kari’s Hope of Christ Presbyterian Church, the program was designed for children ages 12-16 and included volunteers from the church and surrounding area. 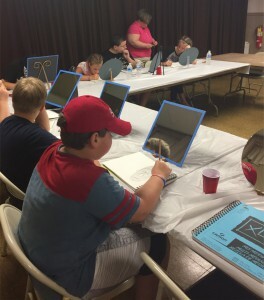 The “Acts of Hope: Creative Arts Day Camp” fit perfectly into a church and community that has a passion for this type of ministry, something Kari first learned when she became pastor there two years ago. Camp day began with a visual arts activity like painting, sketching and sign-making. The campers also made ice candles and pictures created with pastel-colored chalk. After the local summer free lunch program provided food for the camp daily, the afternoon consisted of theater programming led by the Philadelphia-based Pig Iron School for Advanced Performance Training. It’s a group that also worked with adults one evening on a similar program that it used with the children earlier in the day. Eleven children ended up participating in the first-year summer camp, with eight of them not being affiliated with Hope of Christ Church. “It was great to branch out our reach into the community,” Kari said of the church, which does not hold vacation Bible school or even have a regular Sunday school program due to a lack of children. Thanks to a $3,000 grant from the Lehigh Presbytery, three members of the theater school traveled north to Summit Hill and spent five days there working with the teenagers. Kari and two other families hosted the actors in their homes for the week to complete the experience, and most of the helpers with the morning art session were volunteers from the church, all of which helped Hope of Christ Church offer the program for free to the community. “There was a nice balance of using the gifts of our local people and also bringing in people from outside to expose our kids to something they wouldn’t normally get around here,” Kari said. Even though the Creative Arts Day Camp was held in a church building, it did not have a religious component to it. That was done by design, in part because it allows future camps to be considered for non-secular funding and grants.